FIGURE 10-7 Pathways activated by stress. Abbreviations: +, stimulates; —, inhibits; CRH, corticotropic releasing hormone; ACTH, adrenocorticotropic hormone; /3-LTH, /3-lipotropin; GR, glucocorticoid receptor; PRL, prolactin; ACh, acetylcholine; *, ACTH is a growth factor for cells of the adrenal cortex, especially the zona fasciculata cells; **, Cortisol is also released through a rhythmic pathway under the control of a serotonergic neuron. In this 24-hr biorhythm, Cortisol secretion is highest in the morning; thus, Cortisol is secreted by an endogenous pathway that does not rely on stress. 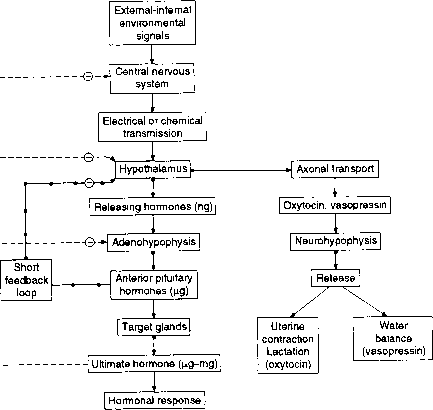 The secretion of Cortisol can be increased greatly by stress, as shown here through the humoral pathway, whereas the secretion of aldosterone is largely a stress response. When the organism becomes immobile or passive, the adrenocortical axis is preferentially activated. This is discussed in detail by Henry (1993).